Hi, this is Chris from Autism Classroom News. As the school year has gotten underway for many of you, the stress and exhaustion has also begun to set in. I've read a number of blog posts recently about the stress of getting the year up and going and then Caitlin had a post on her Facebook page asking for suggestions. She threw it out to the Sparklers for ideas and a post began to brew in my mind that was just longer than a Facebook response could handle. Now, with that said, please understand that I have no real expertise in this area as it applies to my own life. My balance traditionally has been highly skewed toward work and luckily that works for me. However, as I always told my staff, do not use my life as the example of how you should conduct yours. I love, love, love my job. It is a passion and a calling for me, as I know it is for many of you. So how do we keep from being engulfed by the passion (and the guilt as we try to do our best for everyone around us) to the detriment of our families, our friends and our social lives? Here are some thoughts that began to gel in my mind while sitting by the pool on this long weekend. Recognize that the beginning of the school year is going to require a good deal of up-front work. 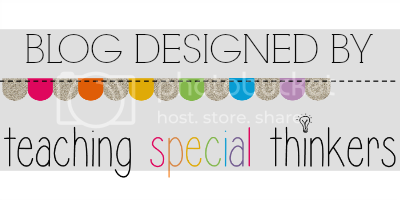 Over on my blog I've been talking about classroom set up and I know that the process I suggest is a whole lot of work! However, I also know that once that work gets done, the rest of the year runs more smoothly than if I don't take the time to do it. So, put some time in now and get the schedule set up, the zoning plan for the staff written down, and some of the instruction planned for the next week or two. Once things are set up in routines, things will run more smoothly and you'll have more time on your hands. 2. Make the most of the time you have. Try to take the planning time you do have and make it as productive as possible. Sometimes I have found I spend significant time discussing how overwhelmed I feel. Some of that is needed to blow off steam, but sometimes if I took that time and could be productive, I would be much less overwhelmed. Schools are inherently social environments and that tends to breed lots of interaction. Sometimes that interaction is extremely productive, but sometimes it's just "admiring the problem" of how overworked everyone is. So, to try to avoid getting sucked into that, try putting a sign on your door in the hour you spend after school that says you are working. I've also learned that if I can't be productive in one thing, sometimes it's time to do something else. So if I'm spinning my wheels with lesson plans, perhaps it's time to run errands. Or allot yourself a specific amount of time to hang in the teachers' lounge and talk and then, when that time is up, go back to your room and finish what needs to be done. While in the short run you lose out time for camaraderie, in the long run you will accomplish more and be happier. Many special education teachers have the opportunity to work with paraprofessionals who support them in the classroom. Many of us have difficulty asking others to do things for us. Whether it be because it won't be done exactly the way we would do it or because we feel responsible because we think it's our job, support staff are there to support. If you have been lucky you might have had a paraprofessional who was like your second brain. She or he anticipated everything you needed before you had to tell them. Don't assume that this applies to most paras, particularly if you are working with them for the first time. Most people need direction from their leader about what needs to be done. Some of the most successful teachers I have met who can delegate well have kept a to-do list somewhere central in the classroom. On this list, the teacher writes in items that need to be made, laminated, cut, created, or organized. Whenever there is a free moment for a staff member, he or she checks the list to complete something. If you are lucky enough to have staff who remain after students leave, this becomes their list of things to do, reducing your need to direct others. Do your paras leave when the students leave? Then the day that the complex kid is out with the flu is an excellent time for someone to pick up the to-do list during the school day. Need visuals made on Boardmaker--teach one of your staff to work the software. Yes, it takes more time to teach them, but once it's done you don't have to be the one to do it anymore. 4. Accept that you can't be everything to everyone. I know...shocking, isn't it? Most teachers I know are successful because they feel they must be everything to everyone. Unfortunately no one can actually manage that. Know someone you think does manage that? Um, I think you might not be seeing the whole picture. Recognize and accept the fact that there will be things that fall between the cracks. The secret is keeping the important things front and center and the little things can wait a while (yes I realize this oversimplifies). Set your priorities within the classroom. Clearly health and safety are the first priority, followed by effective instruction. Your list can go on to be prioritized from there. Bulletin boards, for instance, are low on my list, but might be more important in your school. Also, when you feel that something absolutely must be done, ask yourself: how does this contribute to my primary objectives of safety and instruction. Don't have every visual made for the schedule tomorrow? Can you replace the missing one with a star for special activity? If the answer is yes, then do it and make the visual another day. The class will learn with one less visual as long as you have the structure of the visual in place. And finally, set your priorities other than your classroom. Family comes first, then classroom. That's OK. And don't forget that you have to prioritize yourself into that mix as well. Take time each day to do at least 1 thing that makes you happy. Even if it's reading a book for 15 minutes before you fall asleep at night. Choose one thing that is yours and try to protect that activity. Write it in your calendar. Tell others you are going to do it so you are held accountable. As trite as it sounds, wearing yourself into the ground will not help your family or your students, so allow yourself to recharge. 5. Take time to recharge and breathe. Below is a visual that we often use with our students with autism to help them relax when they are overly anxious. 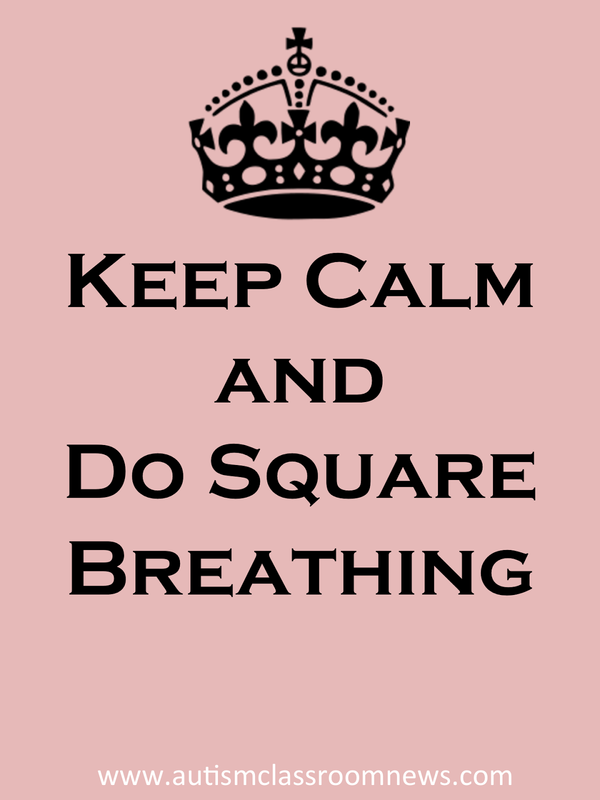 I have a whole district of teachers and administrators who now will turn to each other and we all say, "I need some square breathing." Take some time at the end of the class day before setting off to complete your to-do list to just breath. 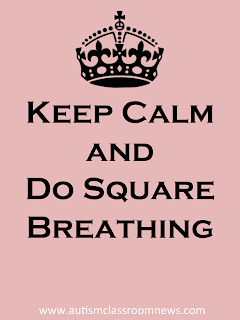 Take in 4 deep breaths, use square breathing, whatever it takes for you to take a moment and reassess your priorities. In the longer term take time each week to disengage from the classroom for at least part of the day. Whether it's dinner with your spouse or partner where work talk is off-limits, or time spent truly watching your daughter play soccer, it will give your brain a chance to recharge. You'll be amazed what happens when you let your brain not think about a problem--suddenly solutions and priorities become clearer because they aren't challenged by the now. Some of my most creative problem solving comes when I am doing everything except thinking about the problem itself. You need the time to recharge and relax or you are going to be spinning like a hamster in a wheel ...and that gets nobody anywhere.